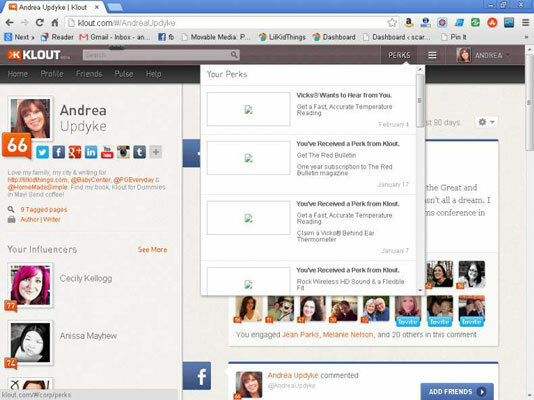 Finding your Perks on the Klout website is a pretty simple process. Because eligibility is based on your Klout Score, geographic location, and topics of influence, you never know what may pop up. Log in to Klout by pointing your browser to klout.com and signing in with either Facebook or Twitter. Select Perks from the navigation bar in the upper right corner of the screen. View Perks in the drop-down list that appears. Some Perks are better than others, and available Perks change from time to time — so checking out your Perks menu regularly is a good idea. Doing so helps make sure that you don’t miss out on a Perk you want to grab. 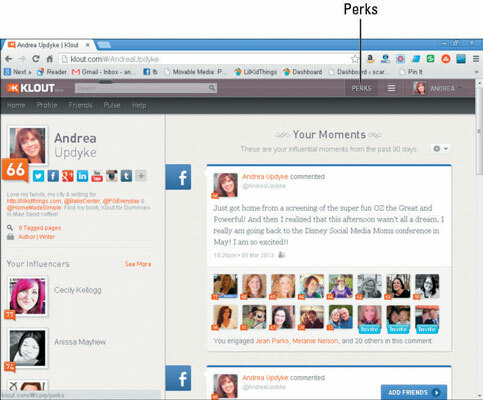 Klout lists all Perks-related information in your Perks notification menu located to the left of your name and avatar in the upper-right corner of the screen. The Perks menu lists Perks for which you are eligible, as well as opportunities to provide feedback on Perks you’ve already claimed. Perks can offer a range of items — from free food to beauty products. 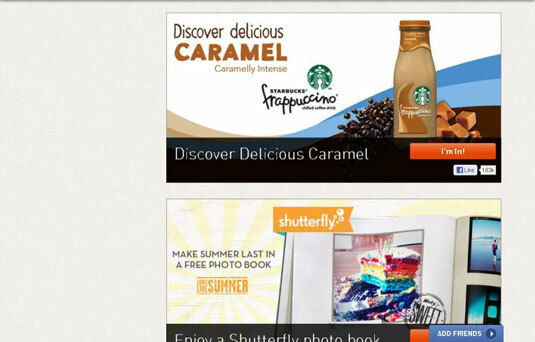 You may also see discount codes for online services like photo books and business cards. 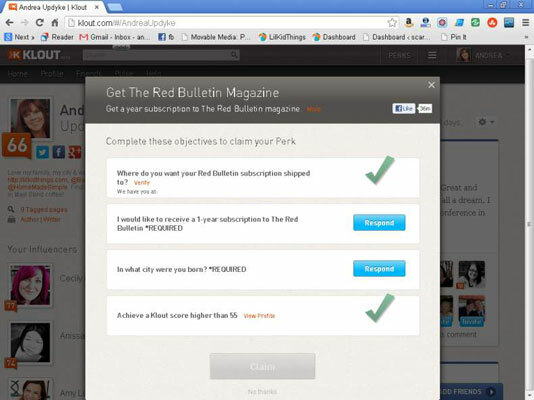 Featured: These are current Perks specifically promoted by Klout. Entertainment: This category includes items related to television shows or tickets to movies and theme parks. Experiences: Much like entertainment, this category typically includes opportunities to attend live events. Food and Beverage: You can receive discounts on products or free samples mailed to your home through this category. Retail: This category offers free samples or full-size products and discounts for online retailers. Sports: Check out items like sports-related discounts and freebies ranging from fantasy football points to protein shakes and magazine subscriptions. Technology: Get the latest on new apps, websites, and products for technology lovers. Klout for Good: You can claim cause-oriented Perks that allow you to give back. Prior campaigns include The American Heart Association. Your Perks notifications menu includes the most recent fifteen notifications, whether you became eligible for a Perk or a brand requested feedback based on a Perk you claimed. When you’re eligible for a Perk, it appears in your notifications menu. From there, if you wish to claim the Perk, simply click it and follow the instructions. A Perk doesn’t appear if you aren’t eligible to claim it. However, some Perks are very popular or have a short supply. If you don’t claim a Perk right away, you may see a message saying that the Perk is full or that you have the option to be added to a wait list. Eligibility for Perks is determined by a number of different criteria such as age, geographic location, topics of influence, Klout Score, and parenting status. Different brands reach out to different demographics for different reasons, so you will likely see a variety of offers over time. For example, some influencers could be selected for a Perk from Starbucks. The criteria for this perk were influencers who live in the United States with a Klout Score above 40 and a coffee-related category among their topics of influence. When you are selected for a perk, you will see the criteria for selection when you go through the claiming process. Like many automated online programs, the system doesn’t always get it right. You may be matched with a brand that’s not a fit for you, or you may be passed over for what seems like the perfect opportunity. Klout is continually improving this process to make the experience better for everyone. You aren’t required to accept a Perk that you’re eligible for.